Actress Bae Doo-na has become the first Korean to appear on the cover of U.S. fashion magazine Vogue in its 127-year history. She shares the cover of the April issue with film stars Scarlett Johansson of the U.S. and Deepika Padukone of India. 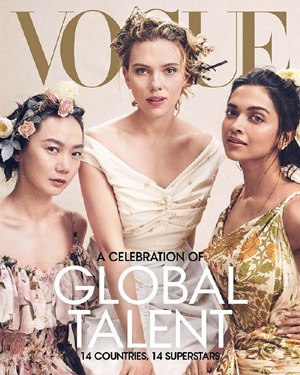 In its cover story "14 Countries, 14 Superstars: The Global Actors Who Know No Limits," Vogue introduces Bae by saying, "The daughter of a stage actress, Bae is a serious performer. She has worked with some of the best directors in Asia -- not just Koreans like Park Chan-wook but also Japanese directors like Hirokazu Koreeda." It adds, "Bae has to admit that her life is 'basically what all millennials would probably dream about.'" The actress made her Hollywood debut with "Cloud Atlas" in 2012 and starred in the Netflix series "Sense 8" and "Kingdom."